This week's topic seems silly, but we want a bit more from you than just a list. A little detail to explain why or show something of your self is REQUIRED! What are your 4 favorite fruits and vegetables? 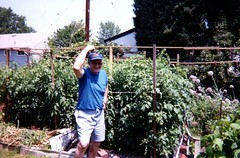 The heirloom tomatoes that my grandfather used to grow in his backyard. Sliced with a tiny bit of salt or a little sugar even! Bananas - I try to eat one every day. Not too ripe and not too green. With a glass of OJ before my coffee!!! Asparagus – brushed with a little olive oil, then grilled with salt and pepper. Perfecto! Starfruit – this stuff is cool! Crunchy, tart, sweet, fun to eat!!!!! Blueberries – fresh from the bush in the morning with the dew still on them! Limes – In margaritas – just the juice though!